Our washing machine is made by GE. The qualifications we were looking for in picking out our washing machine were first, that it was cheap, and second, that it washed large loads of clothes. This model fit those specifications perfectly. It is super easy to use, so yes, even your kids can wash their own clothes. 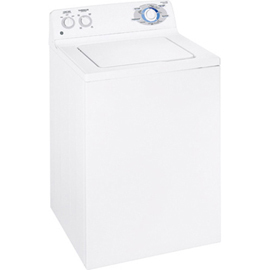 It has three temperature settings and three wash load sizes, and so many ways to wash your clothes that I do not even use them all. You can even fill up the machine with all different colored clothes and set the temperature to cold and nothing will fade onto anything else! That is super helpful when you do not have the time to separate clothes by color. Throw in jeans with t-shirts with underwear with socks and everything always comes out perfectly. It still yet gets out the tough stains too even without pre-treating when you use the hot setting; just make sure you do separate your colors when using warm or hot settings. This model also has the plastic washtub in it so it is easy to clean if you need to clean it. You can also pour in your fabric softener in a separate place and it will dispense it whenever it is time to. It is just an all-around great washing machine. We have had this washer for just 4 years now and we have to replace the motor at a cost of 200.00 plus labor. What happened to "Quality" in GE products?? I will never buy another GE product,,, EVER!!! I think the company short changed all who purchased this washer. Bought this machine at HHGregg on 1/1/09. Soon after had a problem with the springs and mounts that keep the tub in balance. Lots of noise and shaking particularly in the spin cycles. Since it was still under warranty, GE "repaired" the problem. Just last month, now that the unit is out of warranty, the same problem came back with a vengance. The repair technician took it apart and reported that the straps, springs and mounts were bent/broken to the point that repair/ replacement were not practical. He said he could repair the broken parts but the shaking, noise and out of balance condition were there to stay. Tomorrow I'm going to complain to GE Customer Service.I understand the concept of planned obsolesence. However,major appliances should not self-destruct in two years I doubt that there will be a favorable outcome. We will never buy another GE product!!! I have had this washer for exactly one year now. It was marketed as "The Quiet Machine", but you can here the squeaking and grinding and grating sounds all through the house. I've had 2 washing machines prior to this one that I literally used to death, a Kenmore that lasted x 23 years and with millions of loads, then a Roper[ GE Product] that lasted only ten years with a blown motor bearing. So now this one that tangles the clothes horribly, does not self load balancer adjust like it is marketed to, never dared to try the self chlorine or softner dispensers,although I do like the larger load basket but have to unwind the clothes to unload the thing.Would I purchase one again? Nope! should have bought a Maytag, it would have lasted the rest of me days! My husband was so excited to tell me he had bought the "cadillac" of washers & dryers. After 3 years with these monsters, I'm more displeased now than when they were delivered. So much for being energy efficient. The 18 minute rinse & spin cycle takes over 2 hours. The trap must be cleaned out at least once a month. Our clothes smell mildewy and the bleach & fabric softener dispensers either dispense before you've started the load, or not at all. When it was under warranty someone came out to "fix" the problem numerous times. When I say "fix" I mean the problem was resolved for a week or 2. I now go to my firends house to use her refurbished, $150 for the set, washer & dryer. What a waste of money. 24 month old washer with "inverter controlled 3-phase motor". Circuit board on top of motor went bad -part is not available -must purchase new motor with board for ~$200.00 plus labor for a total cost of ~$300.00 for a $399.99 24 month old washer. Needless to say it was trashed and replaced with a Whirlpool. Be very careful before purchasing any GE appliance-many dealers have been dropping the GE brand.